Like most people, adapting to a keto diet led to some changes in my food preferences and sense of taste. I never hated spicy food, but the switch to keto definitely gave me a greater appreciation for it. The vast majority of pepper varieties out there are keto friendly, and even if you don’t opt for a spicy variety, they tend to pack a lot of flavor for the few carbs they have. Best of all, they are the perfect vessel for any number of yummy creamy, cheesy, and/or meaty fillings you can think of. 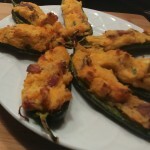 This keto stuffed jalapeno recipe uses a cheese and chicken based mixture to make a delicious buffalo chicken flavored filling. They are perfect as a snack, side, or even as party food for your next get together. 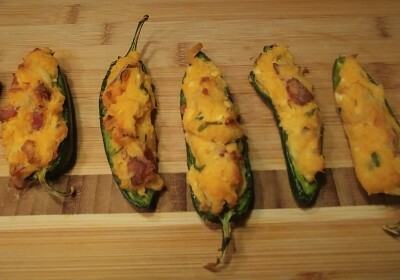 These cheesy keto stuffed jalapenos combine just the right amounts of creaminess and spice! Per popper: ~85kcal, 7g fat, 4g protein, 0.75g net carbs. Preheat oven to 375F. Prepare a baking sheet by lining with parchment paper or a baking mat. Carefully half jalapenos lengthwise, removing seeds and tough inner membrane. In a small bowl, combine all remaining ingredients. Mix well. Carefully spoon filling into each jalapeno half. Arrange in rows on your prepared baking sheet. Bake for 20-25 minutes, or until filling is lightly browned and jalapenos are softened. Best served warm, but can be enjoyed cold. Store refrigerated in a sealed container for up to 3 days. Reheat in the microwave or a low temperature oven (recommended). You can cut back on the spice by using a milder pepper, like mini sweet bell peppers. Make sure to check carb counts on your hot sauce, ranch, or blue cheese dressing; many have hidden sugars added.